Pets | I Shutter at the Thought! I Shutter at the Thought! Photographing people, places, pets and ponderings. She would never do this to you. Please. Spay or neuter your pets. This photo is a response to the Weekly Photo Challenge “texture” theme presented by the folks at The Daily Post. Cat fur (that still attached to a cat, specifically) is one of my favorite soft textures. I hope you like the photo. Many of the photos on my blog are now available on Etsy. If you enjoyed this post, please consider sharing it. Now booking actor/actress and business headshot package sessions throughout Central Florida. Inquire for more information. Someone glued angel wings onto the back of this dog figurine before placing it at the grave of their loved one. I liked the way this particular token of remembrance provides a glimpse of the character of the person at rest here. I couldn’t help but find significance in the dog’s upward gaze toward the heavens. I look that direction a lot, too. Click the image to view larger size and available print options. Curiosity is the very basis of education and if you tell me that curiosity killed the cat, I say only the cat died nobly. If you enjoyed today’s post, please share it with somebody. Booking family, individual, business and pet portrait sittings throughout Central Florida. Ella is a Tortoiseshell, the term applied to describe her unique coloring. Almost always female, Tortoiseshells — or Torties — are typically known for having personalities as distinctive as their coloring of amber, black, cinnamon, brown and red; there’s no white as there is in a Calico. 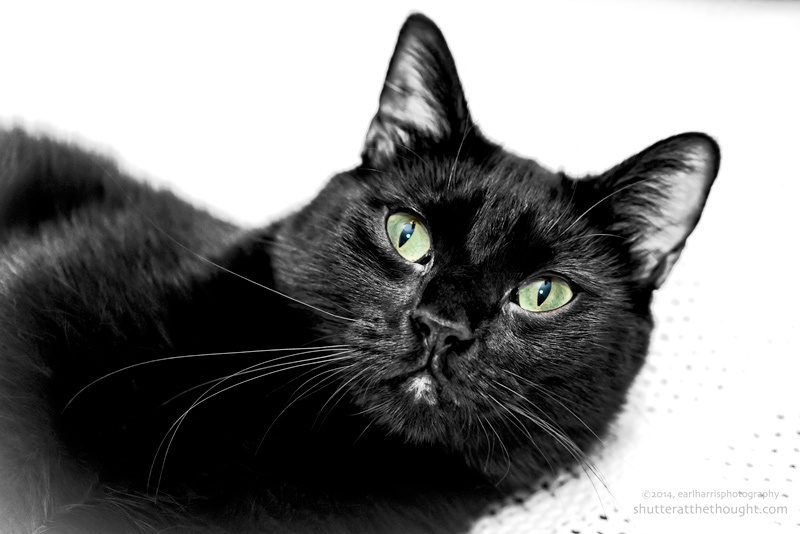 A fireball of personality, Ella is strong-willed, quite vocal and very territorial. She will hiss, spit and growl to demonstrate her displeasure with anything and everything from her chair being occupied to the water in her water bowl being the wrong temperature. She has been known to actually stomp her feet, spit and wail when something isn’t to her liking. This has earned her the name Ella Phzztgerald — “phzzt” being a phonetic approximation of the sound of her displeasure. Lest this give you the wrong idea, Ella is also one of the sweetest and most affectionate cats you could ever hope to meet — once she gets to know you. Initially quite wary of strangers, she hides until she decides it’s safe to let you see her. Once that happens, though, it’s pure entertainment and affection from that point on. Booking individual, couples, family and business portrait sittings. Thanks for visiting I Shutter at the Thought! “Guilt isn’t in cat vocabulary. They never suffer remorse for eating too much, sleeping too long or hogging the warmest cushion in the house. They welcome every pleasurable moment as it unravels and savour it to the full until a butterfly or falling leaf diverts their attention. They don’t waste energy counting the number of calories they’ve consumed or the hours they’ve frittered away sunbathing. Individual, couple, family and pet photography in and around Central Florida. Please visit and “Like” my Facebook page. “You are getting very sleepy” is not a command when said to a cat; it is an eternal truth. 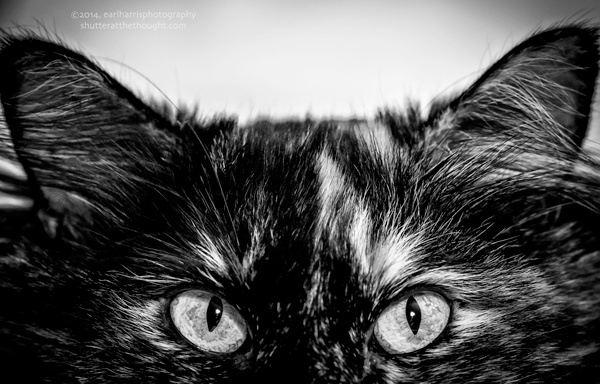 It’s Cat Week on I Shutter at the Thought! Each day this week, posts will center around a cat photo. If you’re a cat person (or a dog), be sure to stop by for a daily dose of cattitude. This photo is available here as a traditional, canvas or metal print. You can purchase a print here. Time is running out! PLEASE vote for this blog in the 2013 Cool Photo Blog Awards – just click this and you’re done. Like Earl Harris Photograpy On Facebook!